Pacific Rim and Lego seems like a great fit - whether it's epic Kaiju-on-Jaeger dioramas, or even home-built mecha right here on the O-Deck. 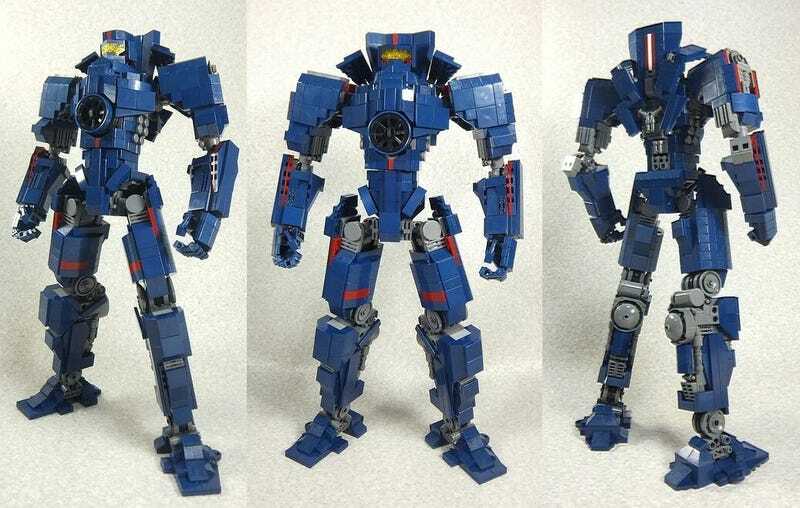 But this amazing model of Gipsy Danger might just be the prettiest Lego Jaeger yet. OMFG! This Lego "Pacific Rim" Kaiju Attack is Amazing! Built by Japanese Lego fan Moko, this 40cm tall rendition of Gipsy has an amazing amount of detail packed into it, from the gears in its joints to the the extra weapons such as the Plasma Cannon, Chainsword, and yes, even the Rocket Elbow. Even Gipsy's reactor lights up! Moko even made some Minifigure-sized Jaegers too, as well as a Knifehead for them to fight. So cute! You can see more of Moko's Lego creations (including a pretty incredible Mikasa Ackerman, of Attack on Titan fame) and more at his Livedoor blog.